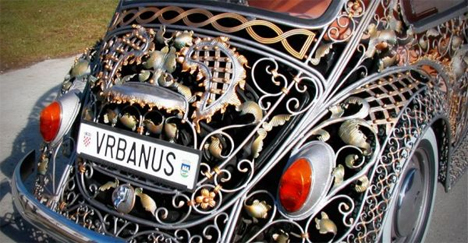 We didn’t think it was possible to make a classic Volkswagen Beetle even more beautiful, but Croatian metalworkers MG Vrbanus found a way to make it so. 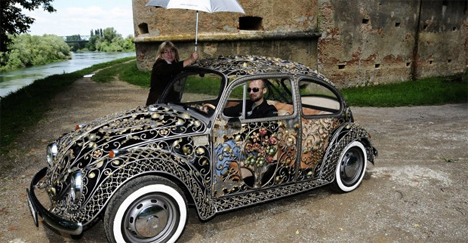 They started with a 1970 Bug and turned it into a sophisticated, intricately detailed wrought iron masterpiece. 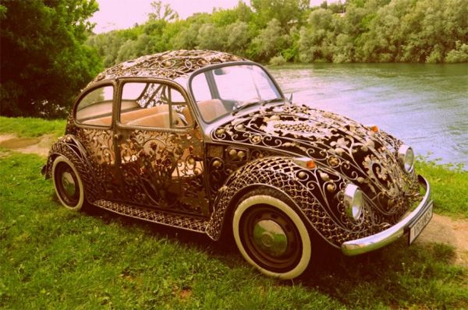 The metal shop started out by sketching a design right onto the body of the car. Step by step, they removed the template and replaced the original body with carefully designed wrought iron pieces. The skilled craftspeople put more than 3500 hours and 5,000 Swarovski crystals into the re-do. Hundreds or pounds of wrought iron and gold leaf went into the project as well, resulting in a body that exposes the car’s inner workings. The gorgeous vehicle is reportedly available to rent for weddings and other special occasions, which really makes us wish we lived in Croatia. See more in Art Vehicles or under Transportation. November, 2013.